How to help a dog with red, cracked paw pads possibly due to allergies? 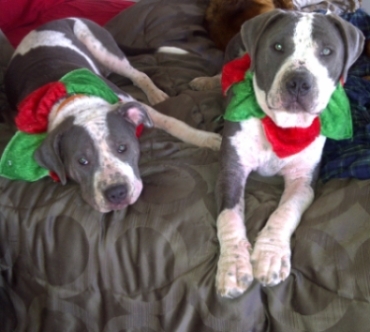 I had the honor of rescuing two Pit Bull puppies from a shelter here in Camarillo. Due to the economy and overcrowding this shelter manages its overcrowding by euthanizing twice a week. 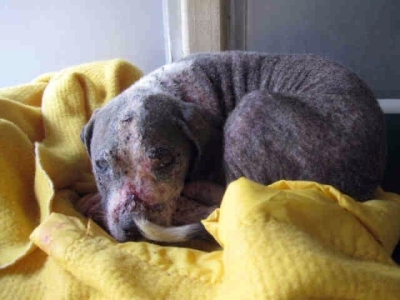 When I saw the photo of one of the puppies that had been brought in it broke my heart and I went to rescue him with the help of a Pit Bull rescue group here in Los Angeles. I knew he did not have a chance. When I went to the rescue I discovered that he had a sister. 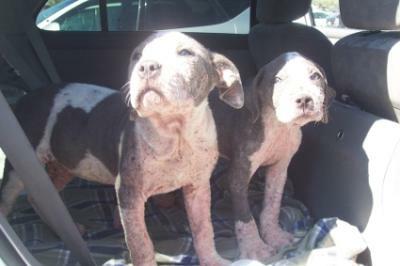 Both the puppies were covered in mange. The boy 90% of his body, and the girl 40%. Wonderful vet in Santa Monica stepped up to the plate and offered free skin test and free medicine to help the puppies conquer the mange. It was a long hard road for all. 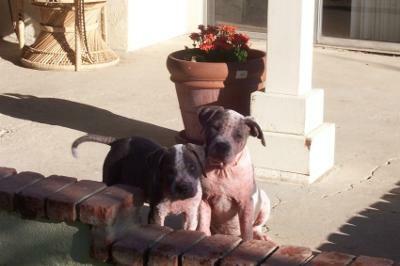 I can happily report that the mange is gone and these pups are happy. We appropriately name them Chance and Hope. Here are a few photos showing their journey this past year. Today I'm writing for some advice on food and allergies. In the past two months the male pup, Chance, has developed very red paws. They sometimes crack and bleed. I have been told by two vets that it may be allergies. One vet wanted to do a very expensive blood test, the other wanted to wait on the blood test and just put the dog on a hypoallergenic diet & antibiotics. If the diet did not show results in six weeks, then the expensive blood test. I have chosen to do the later, as of yesterday I have him back on the Blue Buffalo Salmon food that he had been on while fighting the mange. My question is: Are the Blue Buffalo foods hypoallergenic? If not what hypoallergenic dog foods have you had good luck with? Also any advice and experience anyone has had on this paw/allergy, please pass on. I am all ears. Thank you for your help, stories and advice. Stephanie and the pitty pups. Many people feel that dogs with allergies are better off eating foods with fewer ingredients since there's less chance that something in the food will trigger a reaction. Blue Buffalo does carry a line of limited ingredient food called "Blue Basics" that is designed for dogs with food sensitivities. There's a Salmon and Potato Recipe in that product line. That may be what you're already feeding. Personally, I think Blue Buffalo puts out excellent products. I feed my dog their Wilderness (grain-free) formula. Merlin doesn't have allergies. But, if he did, I'd probably go with the Blue Basics line. I've never had to deal with a dog having cracked paw pads. But I think it's pretty common. So, perhaps others will chime in about their experiences. One thing I wonder about is whether your vet suggested booties to protect Chance's paws--especially if they are cracked open. Seems like his pads could easily get infected without some type of protection. I defenitely agree your priority should be to get to the underlying cause of the potential allergy. In the meantime, I would try some bag balm on his paws - inside the house you could see if he will wear some child's socks held on with medical tape or even a pair of dog booties. I have also had really good luck with a parafin wax product made for sled dogs called Musher's Secret. It can be ordered online. So I have been feeding Evo foods for years now & not one allergic reaction. My friend wanted to save money &fed Blue. It caused allergies. The potatoes are what worry me. there is no need to feed white pots to a dog. Yams yes, the carbs in the white ones don't break down and can lead to allergies, diabetes and obesity. Yams however break down the carbs and are better used by the dogs body because of the higher fiber content. You have to have a degree these days to know whats in dog foods!! But this is what I do, especially the bully breeds, so I hope my ramblings helped. Snoopy never had problems with her pads, but Buster did. Sometimes it is just the genes and we have to adjust the omegas for them. Luck. May God deeply bless you for saiving these pit pups. The picture of Chance on the top is heartbreaking and look at him now !! And you rescued his sibling. Oh gee. As a pit bull owner (rescued from a kill shelter) at 3 months old, I am so grateful for people like you. The love these dogs give you cannot be measured in words. The advise on your page is good for his crawked paws. Take care, all of oyu, from a heart felt pit mother (Peanut i3 name of my now 3 1/2 old pit) from Virginia. It seems to be a thing pit and pit mixes get pretty often. I rescued a lab pit mix, and she was skittish and reactive. I'm guessing not ever socialized. Docked tail. And the area she was picked up in was an area that has an ExCon who is notorious for abusing dogs while trying to train his dogs to be attack dogs. When I got her I noticed she licked her paws constantly. My vet suggested Benadryl, to see if it helped, and if so it was probably allergies. Pits are notorious for having allergies. What I did was muzzle train her, which coincidentally took care of both issues. It helped with the reactivity, and it helps with the cracked pads. I use udderly smooth on her paws and leave her muzzle on for a while while it soaks in. The muzzle makes her less licky and she usually just goes to sleep until I take it off. Then voilà softer cuddles and less scuffed blankets for a few days.